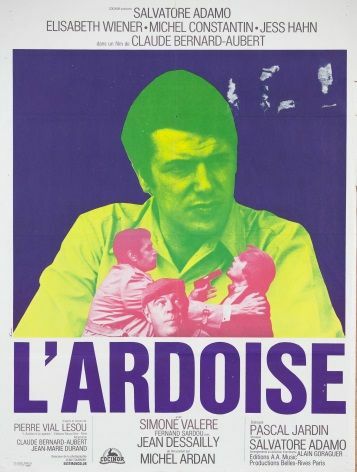 Vintage French movie poster promoting the film L'Ardoise. Philippe, a student, is sent to jail for manhandling his father's business partner, who blackmailed the poor man and caused his death. He shares his cell with two mates: easily offended Théo Giulani and jovial Bob Daniels, with whom he soon establishes a bond of friendship. Still obsessed by the idea of avenging his father, Philippe enters into a pact with the two men: they will break into the partner's office, force open his safe and seize the document exposing the criminal.